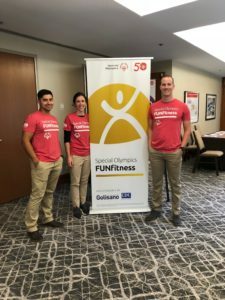 Arthur Cano, Brynn Nahlik and Kory Tieman provided physical therapy screening for international athletes participating in the Special Olympics in Chicago. Recently two NIU Doctor of Physical Therapy students, along with DPT assistant clinical professor Brynn Nahlik, volunteered to screen national and international Special Olympics athletes prior to their soccer competitions. Second-year DPT students Kory Tieman and Arthur Cano developed a fitness screening program in coordination with the American Physical Therapy association called FunFintess to promote health, wellness and injury prevention to this underserved population. Both Cano and Tieman said the language barrier with some of the athletes posed a special challenge. “I enjoyed having to be creative while instructing them to complete the strength screening even with a language barrier,” Cano said. Tieman agreed, and said the language barrier forced him to become more adept at cuing. “I felt the overall experience was incredibly rewarding and I would not hesitate to do it again,” Tieman said.